2013 has been a good year for Lesjöfors Tinglev. We have experienced growth in new customers and orders from our long-lasting existing customers. In 2013 we have strengthened our market position. Our Chinese wire spring production has now successfully been running for three years. We have expanded and developed our corporation with our global customers, delivering the same quality for the local market from our factory in Changzhou. We have invested in European machines and technology in order to assure the same quality and efficiency as in Europe. We are proud of the corporation with our customers, and to be able to add value to your products. Lesjöfors Tinglev. We will help you with all your spring matters. We have this year focused on our work with Corporate Social Responsibility (CSR) and have put the spotlight on health and preventive actions for our staff. The springing point is helping us all to accomplish our goals and stay healthy. In the long run, this helps us to stay in the forefront of giving you the best possible service. Our dedicated focus on customer service, technology and investments will continue and we have an ambitious goal; to grow more than the overall market. It can only be achieved in close cooperation with you. 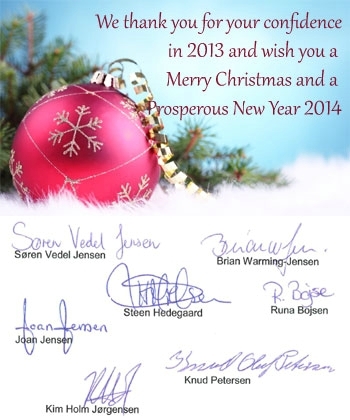 All of us at Lesjöfors Tinglev wants to thank you all for the good cooperation throughout 2013 and are looking forward to the coming year with new opportunities. Our production and administration are closed from December 23 to January 3. We open on January 4 2014 again. The assortment of springs and pressings features a unique range, where one of the widest selections of standard springs is combined with high-tech, customized solutions. Lesjöfors has manufacturing and sales offices in many European countries and in China, Korea and Russia. Our outstanding technological expertise in the group makes us a complete supplier. Let us assist you too!